In the present instance we have no reason at all for diffidence, since the campaign was so successful. But in addition to general accounts, for which the presentations at the Seminar should provide an excellent foundation, we should also examine specific incidents and programmes that provide greater illumination of what we achieved. In the process we should also look at occasions on which we could not achieve all our aims, and in particular incidents in which the Tigers used unusual techniques that caught us unawares. The fact that in the end we defeated them so thoroughly should make it easier for us to also record where they were able to surprise and sometimes thwart us. I propose therefore to suggest here specific examples that could be described to shed light on the whole process. I will also discuss episodes relevant to the work government did with the internally displaced, since that too was relevant to the manner in which the LTTE fought the propaganda war. This will also suggest the need to ensure active information agencies in all relevant government ministries, albeit they should be able to draw on a pool at the Ministry of Information. I would begin with a description of the attacks launched almost simultaneously in August 2006 on Muhumalai and on Mutur. Though there has been much stress on the Mavil Aru campaign, and that certainly was a turning point, I believe there is insufficient awareness generally of how the Tigers came so close to threatening both Jaffna and Trincomalee. There is reason to think that those two relatively forceful assaults were the culmination of what they had been preparing since 2002, when they took advantage of the Ceasefire Agreement to replenish their arsenal and recruit relentlessly. Second, I would encourage a detailed description of what happened at Sencholai, together with personal accounts of the girls we saved. This should be the highlight of a description of the work of the airforce in destroying so many LTTE military installations with hardly any harm to civilians. As I have noted elsewhere, there were nearly 500 air strikes in the period ending in December 2008, and in only 29 of them did even TamilNet allege that there were civilian casualties. In 22 of these I think the allegations were of just one or two casualties, and the rest too were mostly in single figures, which makes it crystal clear that, far from any targeting of civilians, there was extraordinary care to cause no harm to civilians. Sencholai was presented as an exception, but the manner in which the stories on TamilNet changed, and the irrefutable evidence provided by the girls who survived, should be better known. Third, I would suggest an essay on what happened at Kathiravelli. It has been noted elsewhere that there were no allegations at all, save at Kathiravelli, of civilian casualties during the entire campaign to regain the Eastern Province. At Kathiravelli the army did accept responsibility, but explained that its fire had been on the basis of mortar locating radar. There is ample evidence that the LTTE was present with weapons in the refugee centre that was hit, and also that bunkers had been dug there. A thorough study of what occurred will make clear the strategy the LTTE used, and suggest how their success in deceiving relevant sections of the international community emboldened them in the practice of taking and ruthlessly using human shields. The need to do more was being stressed throughout by government, and my own writings make clear the mess that some agencies created with regard to sanitation by not following national standards. But we also should point out the shoddy conditions in which those who had been displaced previously, in particular the Muslims the LTTE had driven out of the Northern Province, had lived for years, with no international concern, until the current government, with the assistance of the World Bank, took measures to improve their lot. The numbers that were housed and fed throughout, with education for their children in line with provisions for children elsewhere, should also be clarified. Fifth, we should devote some attention to the manner in which the entire west of the Wanni, including Kilinochchi and the A9 road, were retaken, with even TamilNet able to allege only 78 civilian casualties in all the operations conducted by the army. While the description of the tactics employed by the various divisions and task forces was fascinating, we should also show how we continued to keep services running, though the LTTE in the end forced the civilians to leave with them. 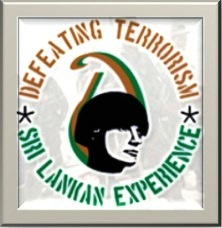 We should also describe the enormous difficulties we had at the end, in breaking through the massive wall the LTTE had built, using earth moving equipment that one of the agencies supposed to be engaged in humanitarian work had allowed them to take from its compound, without advising the government about what was going on. A detailed account of the individuals concerned, and the subterfuges that were employed, would help to make clear the difficulties the armed forces had to contend against. I am sure there are other incidents that would also repay study. But a series of short studies of the above will I think help immeasurably to make clear what we achieved against terrific odds. « The interlocking directorates of the new imperialism.